Cry of the Flying Rhino was written thirteen years ago after I made my one and only trip to Borneo with my mother. I was inspired by the dark, macabre and gothic nature of communal longhouse living and the tribal civilisation and culture which have been around for thousands of years. Two things triggered some ideas. Firstly, during the trip, I saw a tattoo parlour called Headhunters. It piqued my interest in the traditional art and symbolism of Iban tattooing, performed manually with a hammer, steel pin and ink made from tree ash. Secondly, long after our trip, I dreamt of a girl in a longhouse with eyes as huge as the “hollows of the benuah tree”. Those words came to me in the dream. I wrote them down. She looked sad and haunted and there was also terror in her eyes. I did not know who she was or what the dream was about but something unpleasant and unusual had happened to her and I set about finding out about the Iban culture, which I later discovered, is based on dreams. That dreams were everything, our hopes, work, happiness and luck. In exploring the two triggers above, I found out that indigenous cultures are threatened and dying, because of loss of habitat due to logging and deforestation, and due to the conversion of the Ibans to other religions. As a result, orang asli (original people) like the Ibans are forced to leave their habitat for the city because their livelihood, dependent on being able to survive in the jungles on the fat of the land, is diminishing due to the jungles being cleared. Their way of life which is so rich in folklore, superstition and traditions will soon be lost. Ultimately the rapid destruction of the jungles will impact upon the rest of the world via climate change and so on. I also found out that children tattooed children which ensured that the art would never die. If adults were one day wiped out by an epidemic or a massacre, the surviving children would all have learned and mastered all survival and artistic skills including tattooing. 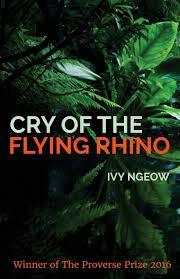 Cry of the Flying Rhino is a modern novel set in the railway town of Segamat, which has already been deforested and turned into miles of plantation, and Borneo, whose jungles are under threat. The Chinese GP, Benjie, has been forced to marry Talisa, a mysterious and tattooed teenager, and the adopted daughter of wealthy crass Scottish landowner Ian. Benjie has to discover for himself his wife’s true identity, when Minos and Watan, two Ibans who leave the jungle and appear in Segamat one day, looking for Talisa. Cry of the Flying Rhino raises uneasy themes of identity, poverty, religion, race, greed, colonialism and post-colonial struggles, and deculturalisation because I want to convey to readers the issues and conflicts which affect Asia today using the medium of fiction. I hope the story will take them to another world. Cry of the Flying Rhino is published by Proverse, in paperback, priced in local currencies. Don't forget Asian Books Blog is currently running a poll to find its Book of the Lunar Year. To vote e-mail the title of your one choice for the winner to asianbooksblogvoting@gmail.com. Voting closes at 5pm on February 15th.